It is 6:18 on a Tuesday night. My two year old son is down for the count, at least for a little while. I think about what to do next. There is that puddle of water on the bathroom floor that I wish I did not know existed. There are the dirty supper dishes on the counter. I can't remember what is in the dryer, but I can remember that Little Mister has a therapist coming in the morning, so I have to mop the floor. You see, the therapists work with him right at his level, on the floor. It is bad enough that these women get down on my hard floor, never mind that they are used to it. The least I can do is make it clean for them. It is the end of January, and I am blue. I wonder if this will be another night where I don't have the motivation to write letters, open mail, do just a little something to reconnect. The instigator of optimism has been arriving in the mailbox, its shiny cover alive with warmth and enhanced color. I squirrel it away and wait for that quiet moment when I can quietly make my wish list, a list of ambitious goals served a la mode with plenty of pie in the sky. It's a list that will be written in ink, sent off to the far away greenhouse where magic beans are created and shipped to us hopefuls. It is the seed catalog. A hearty stalk of Relaxation: A very rewarding crop. Requires supports. Harvest when you least expect it. Successive plantings of rest maximize the yield. Completed Project of Your Choice: Requires frequent watering and weed management. Can be applied to sewing, cleaning, or household organization. Best sown when there is peace and quiet. For Completed Creative Projects see page 35. One Completed Creative Project: Choice of colors: Scrapbook, Quilting, Writing, Decorating. For the accomplished home gardener. Blooms when you least expect it, requires cold or damp weather. Family Time: A resilient ground cover. Able to fill in cracks and endure through the winter. An important feature for all landscapes. Drastically reduces erosion. An heirloom variety. Delightful Surprises: A hearty wildflower mix. Perfect for mixed bouquets of blessings. Previous growers have reported blooms that include happy reunions, new acquaintances, unexpected windfalls, and sudden smiles. A must-have to fill in those places where you don't know what to plant. One Quiet Cup of Coffee without Interruption: Choose from iced or hot varieties. A rare but brilliant annual. One Fruit of the Spirit tree: Our bestseller. Guaranteed to bloom with love, joy, peace, forbearance, kindness, goodness, faithfulness, gentleness and self-control. Prune branches that bear no fruit for best results. Comes with a thick instruction book. It strikes me that like the month of January, hoping and sowing is not for those who give up easily, but as I watch the snow gently falling outside my window in the night, I retreat back into hibernation. A warm fire, some catalogs, and a lively hope for a new season will cultivate this ground for now. I'm with you, my friend, I too look for a place of solitude from time-to-time. I don't have any little one running around, but do have a very long to-do list that grows longer when I check off what I've done... how does that happen? My sweet Mr. D loves to add onto it while I'm not looking, I guess. I feel so accomplished when my house is clean, the laundry done, the baking complete for the week and then I look at the list and there it is... added items. The budget needs to be done, the eggs washed and boxed up, there a hole in the knee of my coveralls that needs to be patched, what's for dinner? Hmmmm I think I'll never be done... really. My winter counted cross-stitch project is lanquishing. Wow, Mrs. Doug, you are one of the busiest ladies I know! That accomplished feeling is so wonderful and yet so fleeting, isn't it? If only it would put up its feet and stay a while. I'm really trying to savor winter because the long hot days of weeding are never too far from my mind! Another great posting, my dear friend! I'm a huge fan of your seed-catalog postings. They are some of my favorites each year! And I love that tractor! 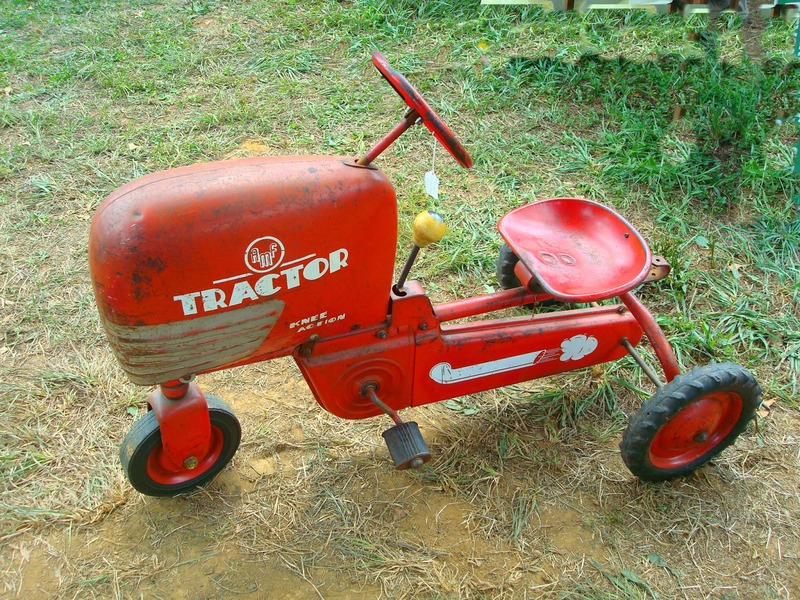 I can just see your Little Mister plowing away on that thing, all summer long! Aww, thank you, BAT Mom, I loved that tractor the minute I saw it. Can you see the little price tag dangling from the handle? I wonder how much they were asking for it? Too cute.